Caravaggio cottons and Linens have been milled in Verese, Italy for over 30 years. The archival necessity of paintings dictate that canvas used for painting be of the highest quality materials. The Caravaggio collection is available in a selection of textures, lengths and widths. 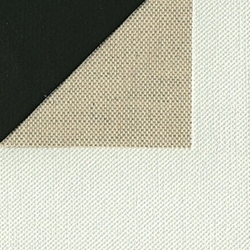 All rolls are prepared using a universal primer that is suitable for oils and acrylics.15 ounce 60% linen 40% cotton double primed with substantial texture and tooth. It is equal in strength to many lighter linens. Suitable for murals and large paintings.